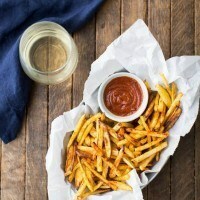 Baked French Fries with Curried Ketchup | Naturally. If you’ve never made baked french fries before, now is the time to start. Homemade fries take just a bit of time but once you make the recipe a few times, it becomes easier. All you need in a good-sized potato and a sharp knife to get started. People often say, when trying to incorporate changes to their diet, that they miss certain foods. When I made the transition to a more plant-based/less eating out diet, I definitely had my moments (good-bye, buffalo wings!) While I didn’t want to replace everything, there were items that could easily be replaced at home like these baked french fries. These fries are the perfect companion to homemade burgers. However, I don’t stop there. I make fries to go with grilled cheese sandwiches. And. they make the perfect base for loaded french fries. Pile these homemade baked fries with cheese and my favorite veg chili for a real treat. Can Baked French Fries Be Crispy? Baking versus frying can mean the difference of a perfectly crisp french fry and a soggy one. With a little patience, baked fries can be just as crisp as their fried counterpart. A few rules I always follow include using enough oil, cutting the fries evenly, and watching closely as they bake. In addition, potato variety can make or break your baked fries. There are many varieties of potatoes but when it comes to fries, I stick with two varieties: Russet and Yukon. French fries are traditionally make from Russet potatoes. The starch content in these potatoes makes the outside crisp perfectly. Nonetheless, over the years, I’ve switched to using Yukon gold potatoes for my baked french fries. More often than not, I can find beautiful Yukon gold potatoes at the farmers markets. These potatoes have less starch than their Russet counterpart. Yet, these potatoes roast really well. And when you’re making french fries, you’re just working towards crispy roasted potatoes. Soaking and Cornstarch: Is it worth it? There are endless techniques for how to make the perfect fry at home. Some methods call for a soaking/rinsing/drying period before baking. I’ve found that when I use Yukon golds, it’s not necessary. With that said, I do recommend this if you’re using Russet potatoes. Other recipes mention coating the cut potatoes with a bit of cornstarch. Again, this works but I just don’t find it necessary. Because we make these fries so often, I like to keep it as simple and straightforward as possible. Making fries at home is also great because you can play around with seasoning. I stick fairly close to the seasonings listed in the recipe below. However, baked fries are the perfect way to play around with seasonings. Spice up your fries with a bit of chili powder. Flavor them with curry powder or berbere spice. Or, if you’re like me and love garlic, bump up the seasonings already listed. It’s hard to go wrong with this recipe! Perfectly crisp homemade baked french fries are one of the recipes we make nearly every week. These fries are the perfect companion for burgers, sandwiches, or even salads. Preheat oven to 400˚ and line a baking tray with parchment paper. Rinse the potatoes well. Taking one potato at a time, cut the ends off the potato to create a level surface. Stand up on one end and cut down the potato in 1/4″ thick slices. Stack half the slices on the flat side down and cut again into 1/4″ thick strips. Repeat with remaining potatoes. It’s important that the fries are cut in similar thicknesses. This will help the fries bake evenly. 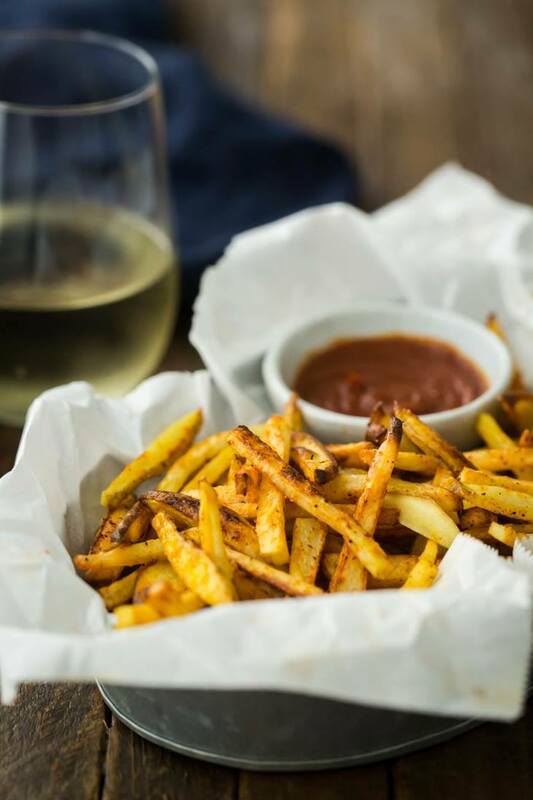 Place the fries on one or two baking trays and toss with the olive oil, spices, salt, and pepper. Spread the fries out so that the are mostly not touching. 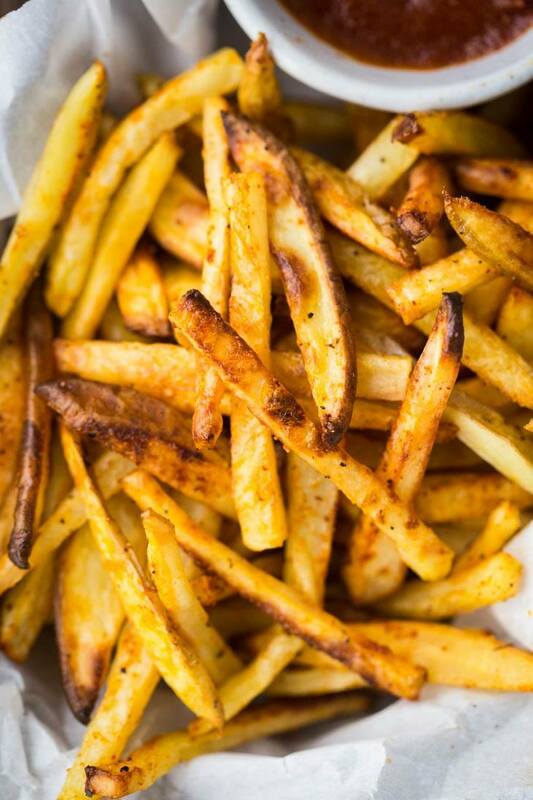 Bake the fries for 30 to 35 minutes until crisp and golden. While the fries are baking, stir together the ketchup and curry powder. 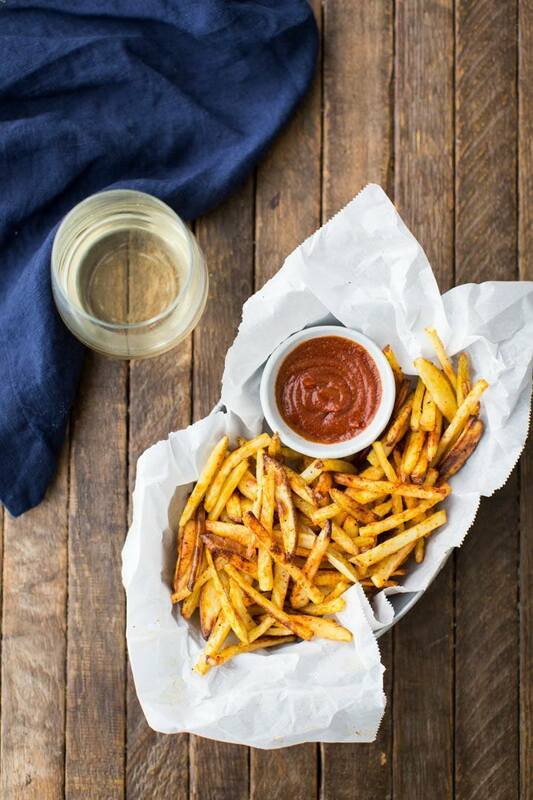 Serve fries hot with your favorite sauce or the curried ketchup. If you want to use traditional russet potatoes, I recommend soaking the cut fries in cold water for at least 30 minutes then rinsing before tossing with olive oil. If I’m making my homemade ketchup, I’ll add the curry powder into the cooking process. My original fry recipe called for adding dried oregano, parsley, and a pinch of mustard powder. Try playing around with the spices to find your favorite combination. You totally nailed those oven fries! They seriously look perfect! Yum, these look delicious. I made homemade fries all the time but have never soaked or rinsed them before. Going to give these a try. Love the idea of adding curry powder to ketchup too. Beautiful photos! I know about those cringe-worthy recipes + photos all too well. I’ve got more than a few that could use some updating. YIKES. But can we talk about these fries? BECAUSE HOLY HECK THEY LOOK PERFECT/AMAZING/JAW-DROPPING DELICIOUS. And I’d like an entire basket for lunch, please. I’ve looked back on my old posts to yummy recipes and man oh man I HATE what I took! Oh well, your live and learn. I did love your video and recipe for these fries! I’ll definitely try them with sweet potatoes! Ah the german catsup! Curried ketchup is the best, and yes I agree it’s always nice to re-do old recipes and it’s really cool to see how far you’ve come! I’m can usually only appreciate homemade baked french fries with much garlic, truffle fries (because #fancy), and In N Out fries because my California roots are strong. But these inspiring me to try a new spice palette and enjoy some baked ones once again! I am most definitely trying Yukon as yours look like the ideal texture! Lovely. These sound delicious and not too difficult to make for somebody who isn’t quite a pro in the kitchen yet…. Will definitely be trying these! Thanks for sharing. I love your honesty in this post. I still struggle with this all the time — and not just the old posts! You’ve inspired me to forgive myself for the less than stellar posts because it’s okay to go back and give it a second try. Thanks for sharing! Love this! Do we get more vids in the future?! I’m hoping to make these types of videos a series! girl, i so get this. Crusty old posts from years ago make me cringe but it also allows me to appreciate the progress. these look FAB! These look delicious. I haven’t tried soaking the potatoes in cold water first. Yum. Excellent recipe, certainly I’m addicted to your recipes. I love french fries. where is the recipe for your homemade ketchup?